What is a permaculture farm or homestead? As a homesteader rural or urban, you might be thinking what’s next? How can I take the next step in self-sufficiency or being more “green”. With a permaculture edge, your homestead can be that and so much more. Even though permaculture isn’t exactly new, it also isn’t mainstream, and most definitely not words you will hear in the typical farming world. By definition permaculture farming or a permaculture homestead is an agricultural system designed with the intentions of being self-sufficient and sustainable. Permaculture as a term is fairly new, but by practice is very old. It’s the way your great-grandmother would recycled eggshells back to the chickens or to the garden. Or in the way, the pre-Aztec people of Mexico used Chinampas to grow enough food to make big Ag today jealous. Basically put, permaculture is creating an ecosystem that takes and uses one thing for many different parts. Designing your permaculture is as much about creativity as it is about ingenuity. Looking at what you have or what you need and finding how you can weave that throughout other things. You want chickens what or how could you feed your chickens in a sustainable way? What else could your chickens do? Pest control maybe, garden fertilizer perhaps…. There are no two permaculture designs alike. Every permaculture farm, homestead, and home are different. Different climates, needs, situations etc. A food forest is a very powerful concept for the permaculture farm or the self-sufficient homestead. A food forest is also known as a forest garden or a 7 layer garden. It is the idea that a forest still grows massive amounts of food without a gardener to always tend to it. Sustainability and low maintenance are the key concepts here. Just as in any forest there are a variety of trees shrubs, vines, ground plants and even root plants that are edible. Think of the food forest with tall trees like nut trees and shorter trees like fruit trees, a shrub layer like blueberries, vines like grapes, perennials like asparagus, rhubarbs and ground cover like strawberries that all come back year after year. Add into that mix a few plants and flowers that happily reseed themselves, and just like that, you have a low maintenance food production dream! A pond is a pond, right? Well not on your permaculture piece of heaven. A pond is a resource for just about everything, from storing water, heat, giving light, and yes of course even feeding. A resource that has so much capability just has to be one of the, if not the top things on any given sustainable homestead. A wonderful resource for ponds on a homestead or permaculture farm is one of my favorite books The Bio-Integrated Farm, With tons of examples math formulas and more on how to exactly install your own pond for maximum benefit. Ever find yourself thinking thoughts like; man feeding these chickens gets mighty expensive! Or whats in this little pellet anyway? Yeah, I know me too. This is by no means an extensive list but rather a place to start. If 100% sustainability is your goal check out how feeding chickens can be done on the cheap and in a much more sustainable way! Aquaponics is not a venture for the faint of heart and it never works perfectly on the first try, but for the experimental or “science-minded” homesteader it is the perfect addition. Aquaponics is great in many permaculture scenarios. In many cases, aquaponics actually uses less water than a traditional garden all while producing more plants per space given and at a much faster pace. Soil compaction, tough root conditions or lack of water are never an issue for the plant. You also get the added benefit of a secondary crop of producing fish, if that is your wish (none of my Kansas born family will actually eat fish, so we don’t do it for the fish). Your saying right this is a no-brainer. I would agree. 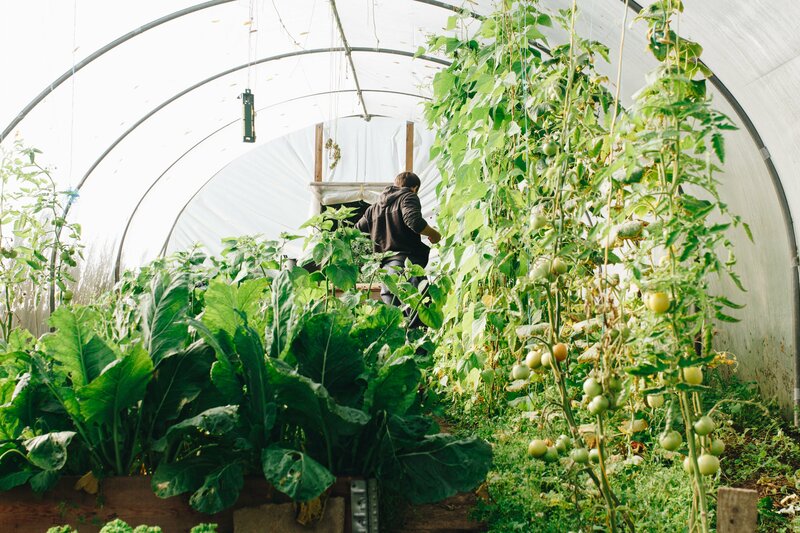 The amount of value a greenhouse or even cold frames can add to your homestead or permaculture farm is huge. A greenhouse has given us numerous fresh salads in the dead of winter, plenty of early starts to the garden, plant protection in harsh elements and even warm sunny days to go play in the dirt when winter is still going full force outside. Aside from my love of warm sunny places a greenhouse can really be counted as an asset to any homestead or garden, be it a controlled climate to grow something that’s not so natural to your environment, an extended garden season, a place to house your aquaponics. P.S. Looking for more sustainable homesteading ideas? Join The Upcycled Family community for regular ideas, DIY’s, recipes and more!